236 pages | 2 B/W Illus. The European Commission has increasingly focused on the benefits it can derive from the greater participation of organized civil society in its role and activities. In the face of general decline in public trust in the institutions of government, it facilitated and encouraged new channels of access and consultation opportunities as a means to legitimize its position within the European political system. 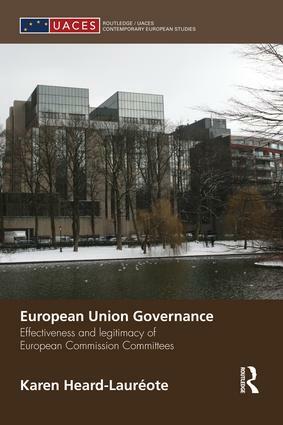 Karen Heard-Lauréote’s comparative analysis of four European Commission advisory forums innovatively investigates the existence of a conflict between the capacities of such forums to deliver standards of good governance. The author questions whether these venues can provide efficiency gains via the production of sufficient policy output without delays or deadlocks at reasonable cost and sustain adequate democratic credentials such as legitimacy. This study makes a significant contribution to its field by pursuing contemporary legitimacy debates asking whether under certain conditions or in certain policy-making contexts, legitimacy and efficiency may be reconciled or become at least partially compatible in European Commission committees. European Union Governance will be of interest to students and researchers of European Union politics and policy-making. The Contemporary European Studies Series is an outlet for the publication of first-rate research in European Union Studies. The series primarily publishes research monographs but will also consider proposals for research-driven and thematic edited volumes. Although predominantly a Politics/IR and Law series, the series editors are keen to encourage approaches that are interdisciplinary. CES seeks to publish excellent material from both established and new scholars.